Crossbow consists of three 13-inch LCD color displays mounted triangularly on the wall. The display at the apex is turned 90 degrees clockwise making the screen vertical. Two cameras were mounted on the arms of the artist and positioned to record the hands from the back and their immediate surroundings. These images are displayed on the left and right screens corresponding to the left and right hands. 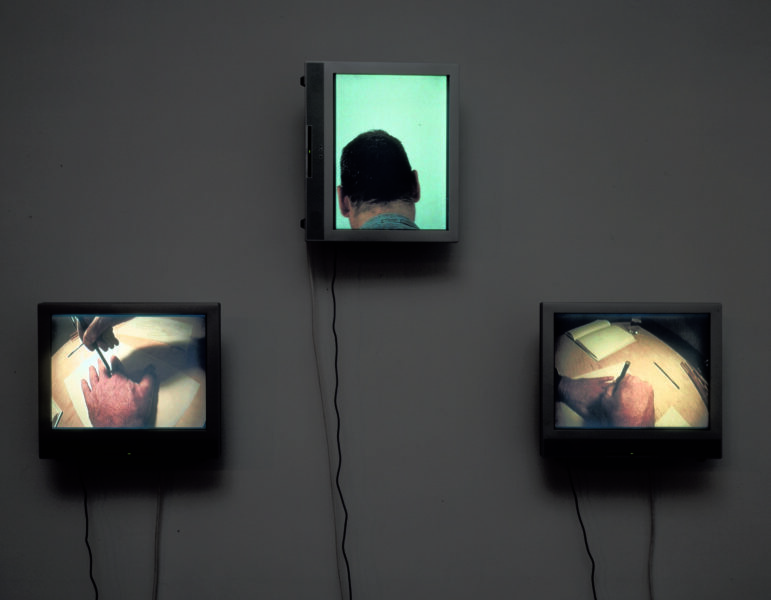 A third camera was attached to a brace on the artist’s body that enabled the camera to record the back of the neck and head. This is displayed on the middle (vertical) screen. The artist is sitting at a table with a notebook, paper, pencils, a glass of water and a sho, a Japanese musical instrument. The cameras, in effect, record the thinking process as the subject utilizes the various objects. 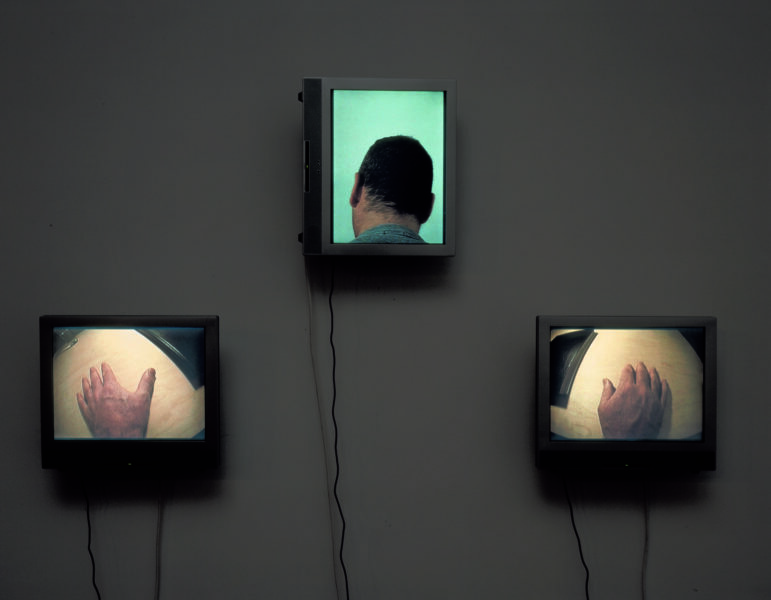 The three independent images were recorded simultaneously, and the three recordings are played back synchronously. 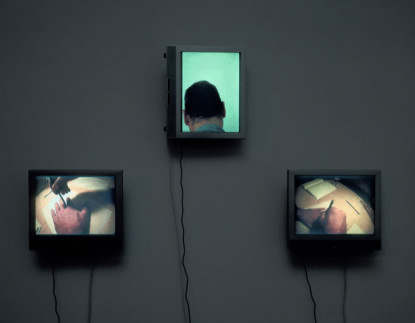 An example of this work was first exhibited by Donald Young Gallery at the Armory Show, New York, New York, February 18 – 22, 1999. Galerie Jamileh Weber, Zurich, Switzerland, September 30 – November 18, 2000. “Gary Hill: Language Willing,” Boise Art Museum, Boise, Idaho; December 11, 2002 – February 16, 2003; Arizona State University Art Museum, Tempe, Arizona, October 25, 2003 – January 18, 2004; Northwest Museum of Arts & Culture, Spokane, Washington, March 4 – June 20, 2004; Art Gallery of Nova Scotia, Halifax, Canada, July 17 – September 19, 2004; Salt Lake Art Center, Salt Lake City, Utah, October 15, 2004 – January 16, 2005. 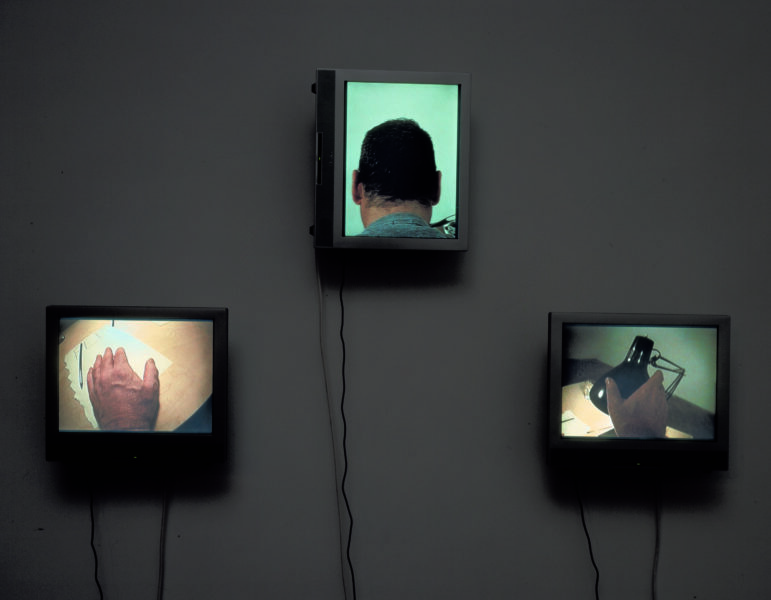 “Gary Hill / Bruce Nauman: International New Media Art,” National Gallery of Australia, Canberra, Australia, December 14, 2002 – March 9, 2003. ZOO 3 (October 1999), p. 178. Bakke, Erik. “Gary Hill: Barbara Gladstone Gallery.” New Art Examiner (February 2000), pp. 54 – 55. Gary Hill en Argentina: textos, ensayos, dialogos. Buenos Aires: Centro Cultural Recoleta, 2000, p. 14. Gary Hill: Instalaciones. Córdoba: Ediciones Museo Caraffa, 2000, pp. 57, 68 – 69. Quasha, George and Charles Stein. La performance elle-même in Gary Hill: Around & About: A Performative View. Paris: Éditions du Regard, 2001, p. 2. Gary Hill: Selected Works and catalogue raisonné. Wolfsburg: Kunstmuseum Wolfsburg, 2002, pp. 18, 226, 239. Zutter, Jörg, ed. Gary Hill / Bruce Nauman: International New Media Art. Sydney: National Gallery of Australia, 2002, pp. 4, 12 – 13, 27, 28, 29, 34 (photo). (Includes George Quasha’s essay: “Gary Hill’s Art of the Threshold.”) Note: Jörg Zutter’s essay “Gary Hill / Bruce Nauman: International New Media Art” reprinted in: artonview No. 32 (Summer 2002 – 2003), pp. 6 – 11. Quasha, George. Gary Hill: Language Willing. Barrytown, NY: further/art and Boise: Boise Art Museum, 2002, pp. 7, 40 – 47. Oland, Dana. “Art at the point of impact.” The Idaho Statesman (December 14, 2002), pp. Life section, 1, 14. Schwabsky, Barry. “Gary Hill.” Contemporary 71 (2005), pp. 58 – 60. Gary Hill: Resounding Arches / Archi Risonanti. (Catalogue and DVD.) Rome: Ministero per i Beni e le Attività Culturali Soprintendenza archeologica di Roma, and Milan: Mondadori Electa S.p.A., 2005, pp. 148. Quasha, George and Charles Stein. An Art of Limina: Gary Hill’s Works and Writings. Barcelona: Ediciones Polígrafa, 2009, pp. 329, 331 – 332, 337, 343 – 347, 350, 374, 574. Noble Gäste: Meisterwerke der Kunsthalle Bremen in 22 deutschen Museen. Bremen: Hachmannedition, 2009, p. 204.